SEOUL, Jan. 12 (Yonhap) -- The "Like" button online has been criticized for cheapening the meaning of the word, but what if it actually conveyed a serious message? That's the premise of director Park Hyun-jin's upcoming movie "Like for Likes," which follows three couples relying on social media to communicate their innermost feelings. "Hallyu" megastar Choi Ji-woo, who plays an "old maid" flight attendant, has partnered with actor Kim Joo-hyuk, starring as a lovelorn chef. Actress Lee Mi-yeon will portray a notorious screen writer falling in love with an arrogant K-pop star played by Yoo Ah-in. Kang Ha-neul from the tvN office drama hit "The Incomplete" will play the role of a genius composer and actress Lee Som a rookie soap opera producer. "Like for Likes" also marks Choi's return to the silver screen after seven years. "Somehow I ended up focusing on soap opera roles. I wanted to work with many actors in 'Like for Likes' because I've been away from the silver screen for so long," she told reporters at a press conference in Seoul. Contrary to her icy image, Kim said Choi had an "airhead kind of charm." "It was easy to work with her from Day 1. She was very bold," he said. "I found her absent-mindedness charming. She can be kind of an airhead, but I find that endearing. Also, she's pretty." Yoo sang praises of his partner Lee Mi-yeon, calling her "my ideal woman whom I personally look up to." "In real life, she's very similar to the role she plays in the movie. She would come up to me unannounced and leave just like that. It was fun working with her," he said. But Lee said despite being many years his senior, she felt her acting came up short compared to Yoo's. "Yoo has a very strong personality and concentrates on his acting so much that I felt like I was losing in the acting department," she said. "It was overwhelming but also refreshing." The Kang Ha-neul-Lee Som duo also appeared to have cozied up with one another after filming the movie. "I thought Lee Som wouldn't be friendly after looking at her modeling photos," Kang said. "But she was really down to earth from the beginning. We naturally became friends without my trying." "Like for Likes" opens on Feb. 18. The film industry’s most sought-after stars gathered together for new romantic flick “Like for Likes,” perfectly timed for Valentine’s season this year. The new romantic comedy stars actresses Lee Mi-yeon and Choi Ji-woo, heartthrob Yoo Ah-in, actor Kim Joo-hyuk and rising stars Kang Ha-neul and E Som. Directed by Park Hyun-jin, the omnibus flick delves into different styles of love using social media, as shown through three different couples. The stars and the director Tuesday attended a press conference in Seoul to talk about the film and share their stance on relationships and social media. “Like for Likes” is set to open in theaters Feb. 18. Veteran stars, rising stars and rookies are all coming together to form the cast of the highly anticipated omnibus romantic comedy “Like for Likes,” from director Park Hyun-jin. Featuring accomplished actresses Lee Mi-yeon and Choi Ji-woo, 2015’s trendiest actor Yoo Ah-in (“Veteran,” “The Throne”), TV variety show star Kim Joo-hyuk (“1 Night, 2 Days”), Kang Ha-neul (“Twenty”) and model and actress E Som, the film shows how three different 21st century couples fall in love using social media. The “Likes” in the title is a play on the “Like” function on Facebook, which becomes a bridge for the couples in the story. “The scenes portray how people today utilize social media, which should be fun and relatable. It’s a romantic film that reflects current trends,” explained director Park Hyun-jin at a press conference at CGV Apgujeong on Tuesday. Each of the three couples portrays a different type of relationship. Lee Mi-yeon and Yoo Ah-in play a prickly, seasoned star drama writer (Gyeong-ah) and cocky A-list actor (Jin-woo), respectively. They bicker and fight, but eventually grow close. Yoo, who had said that Lee was his ideal woman even before he began acting, said their real-life professional relationship was quite similar to their on-screen romantic one. “It would be a very one-sided interest, and (Lee) would back away,” he said. Choi Ji-woo plays a flight attendant named Ju-ran who seems smart and well put together on the outside, but is actually quite naive and clumsy. When she is defrauded out of her home, she moves in with her neighbor. The neighbor, Seong-chan (Kim Joo-hyuk), is nosy but kindhearted, and tries to help Ju-ran with her personal life. Kang Ha-neul plays Su-ho, a character very similar to his role in “Twenty,” an innocent young man with no experience with women. Su-ho is yanked around by the coy Na-yeon (E Som), and they eventually find love as well. “Like for Likes” is an easy, relatable romantic comedy for 2016 that is expected to follow the cozy vibe of Park’s previous romance, “Lovers of 6 Years,” featuring Kim Ha-neul and Yoon Kye-sang. “Like for Likes” opens in theaters Feb. 18. A romantic comedy featuring A-list stars, including "Veteran" star Yoo Ah-in, will hit the big screen here next month. Titled "Like for Likes," the film features three couples ― Yoo Ah-in and Lee Mi-yeon; Kim Joo-hyuk and Choi Ji-woo; and Kang Ha-neul and Lee Som. At a press conference, Tuesday, director Park Hyun-jin introduced her film, the love stories of three couples who start dating on a social network service. "Reflecting the current trend that more people use social media for relationships, the three couples in the film develop their relations through Facebook," the director explained at a theater in Apgujeong, southern Seoul. The six protagonists starring in the new film commented how satisfied they were with their on-screen partners and enjoyed filming. "Shooting with actor Yoo Ah-in was a completely new experience," said actress Lee Mi-yeon, who dates the younger actor in the movie. "As many know, he is a person with distinct characteristics and has a great passion for film, so I was under pressure to keep up with his tremendous concentration while shooting," the 44-year-old actress said. Responding to Lee, Yoo said "I have respected her for a long, long time and have regarded her as my ideal type ever since I began acting in the industry. Overall, I had enjoyed working with her." In the film, Lee features as a veteran television drama writer while Yoo plays the role of a top actor. Actor Kim Joo-hyuk, who becomes a couple with actress Choi Ji-woo said he had felt comfortable working with Choi from the first day they met. "I was comfortable showing with her from the beginning of the film. She's an actor with ingenuous beauty and of course, she looks so beautiful," Kim said. "We hadn't met each other even on an informal occasion. But after I heard that my on-screen partner was to be played by him, I was like free from care. He is caring and I could concentrate on shooting thanks to his consideration," Choi responded to Kim. In the film, Choi plays an air stewardess while Kim is a tenant who rents a room Choi's house. Actor Kang Ha-neul and actress Lee Som, both 25, revealed their first impressions of one another before shooting began. "After meeting with her, I knew she was an unaffected and honest person," Kang said. Lee made his name as an actress after taking a lead role in 2014 romance "Scarlet Innocence," also said that she learned a lot from Kang. Kang plays an up-and-coming composer who has never dated in his life and Lee portrays a rookie television producer who refers to herself as an"expert on dating." "Like for Likes" will hit screens nationwide from Feb. 18. What do K-stars think of Facebook’s ‘Like’ button? Korean stars featured in the upcoming movie “Like for Likes” shared their views on social networking tools’ friendly yet formidable function: the “Like” button. At the movie’s promotional event Tuesday, seasoned actresses Lee Mi-yeon and Choi Ji-woo, rising star Yoo Ah-in, featured in hit movies such as “Veteran” and “The Throne,” TV stars Kim Joo-hyuk and Kang Ha-neul and model-actress E Som answered questions about whether love can be bloom via social networks by clicking the “Like” button, as in the movie. Kang, 25, said he has neither sent nor received love confessions online. “Personally, if I have to say something very important to a counterpart, like confessions such as ‘I love you,’ I will meet her in person,” Kang said. E Som has not experienced confessions via social networks, but added that it depends on the mood. “I am willing to answer him over the Web saying ‘I should meet you in person,’ if I find myself in love with him as well,” the 25-year-old model-actress said. Actor Kim, 43, and actress Choi, 40, who post sugary selfies on their social network accounts in the movie, both said they never post selfies in real life. They both agreed they prefer scrolling through their newsfeeds and seeing others’ accounts, saying they had that in common. The 29-year-old Yoo, playing a young hallyu star in towering spirits, who attracts Kyung-ah (Lee Mi-yeon) over the Internet, said his nature is far from that of his role. Lee Mi-yeon, 44, playing screenwriter Kyung-ah, said she doesn’t have an account. Actors had mixed reactions over the growing popularity of social networking tools among the youth. The omnibus movie, highlighting three couples who connect online, is set to be released Feb. 18 in Korea. With “Like for Likes,” what you see is what you get: A cookie-cutter omnibus romantic comedy featuring three couples, tangentially linked, each finding his or her way to an ever-after ending. The men are sweet, the women are adorable and butterflies abound as the familiar stages of courtship unfold. It’s difficult to imagine how this setup could yield surprises, yet one still feels a tinge of disappointment at the way in which “Like for Likes” fulfills its promise to a T. If any romantic comedy could give the tired tropes a whirl, it seemed “Like for Likes” would be it, because of its all-star cast, if nothing else. The first couple is made up of veteran actress Lee Mi-yeon (most recently in the hit drama “Reply 1988”) playing a haughty, sharp-tongued TV writer and Korean cinema darling Yoo Ah-in (“Veteran,” “The Throne”) playing a carefree, selfish international superstar. The second couple throws together hallyu star Choi Ji-woo, who rose to stardom with the TV drama “Winter Sonata,”, with steady actor Kim Joo-hyuk, who was in the comedy film “The Beauty Inside”. Choi plays a hardworking yet clumsy flight attendant while Kim plays a friendly chef who likes to poke his nose into everyone’s business. Through a series of unfortunate events, the two become unwilling roommates and eventually very close friends. The third couple struts out Kang Ha-neul, who was in the movie “Twenty,” with model and actress E Som, who was in the movie “Scarlet Innocence”. Kang is a gifted composer with a hearing impairment who has no experience in love, while E is a savvy TV producer who finds her next plaything in Kang’s character. It’s a cast of A-list names with solid, serious acting credentials playing cliched characters. Despite the film’s attempts to market itself as being fresh and trendy by having all three couples eventually hook up thanks to the power of social media, online networks play a minimal role in the plot itself. Any romantic comedy set in 2016, in fact, should incorporate Facebook stalking and messaging in order to seem realistic. The interesting way in which “Like for Likes” differentiates itself from other syrupy sweet love films is through its female characters. They have strong careers and strong expressions of self-worth beyond simply being one-half of a relationship. Director Park Hyun-jin told reporters at the press preview that she wanted the female characters to be “independent” rather than be “swept around by the male characters,” and that intent jumps out through certain lines in the film. Choi Ji-woo’s character casually corrects the term “spinster” into “single woman” in conversation, and Yoo Ah-in’s character chastises his colleagues for calling Lee Mi-yeon’s character bossy and headstrong saying that a man who had this type of personality would be considered self-assured. Unfortunately, those socially conscious lines generally fall in awkward thuds even from the mouths of the excellent cast. They are jarring when considering the overall mood of the film, and these moments come across as a break in character. “Like for Likes” isn’t bad - it is well-edited, smoothly paced and has an appropriate mix of cringe-worthy lines and laugh-out-loud moments. All of the characters are natural and comfortable and seem to fit well with the real-life personalities of the actors who play them. It’s a shame that it opens after Valentine’s Day weekend, because it seems like the perfect date movie. However, for anyone who expects this star-studded film to be something beyond effortless archetypes, the film is likely to leave something to be desired. “Like for Likes” opens in local theaters on Feb. 18. Lighthearted omnibus romance films have been around for awhile, especially since “Love Actually” hit the jackpot internationally in 2003, making it a regular visitor to both the big and small screens during the Christmas season. A number of Korean films have attempted to reenact the success by featuring more than one pair of people and trying to convey a heartwarming message that penetrates all the loosely connected stories. But until now, there hasn’t been a single movie that came close to the success of the original. But just when you think the fad has finally died out, another film of the same format is trying to reinvigorate the genre. Titled “Like for Likes,” the film directed by filmmaker Park Hyun-jin of “Lovers of Six Years” (2008), is a contemporary love story that revolves around three couples and how their use of social media influences their relationships. The biggest charm of the film is its hardly believable all-star cast including Korean heartthrob Yoo Ah-in along with weighty actresses like Lee Mi-yeon and Choi Ji-woo, both of whom are appearing on the big screen for the first time in at least seven years. The central couple consists of Lee, who plays the star screenwriter Kyung-ah, and Yoo, who plays a character very much like himself in real life: a superstar actor. After one of Kyung-ah’s early works boosted Yoo’s character Jin-woo to immediate stardom, the two have been at each other’s throats for unclear reasons. Kyung-ah is aiming for a spectacular comeback in the drama scene, which wouldn’t be possible without Jin-woo, but he won’t accept the role, and their back-and-forth continues. 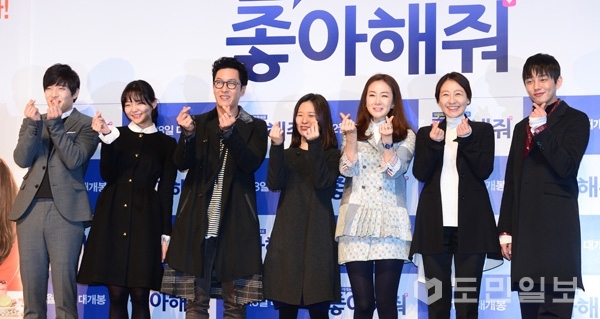 The second couple is made up of Hallyu star Choi Ji-woo, who plays the attractive stewardess Joo-ran, and Kim Joo-hyuk, who plays her landlord as well as housemate. Joo-ran may be all that any man could wish for, but her naive attitude around them is hindering her from finding her future spouse and time is running out. Kim’s Seong-chan voluntarily coaches her to present herself nicely on social media to grab guys’ attention, but things start to change as their feelings toward each other enter into unknown territory. The most realistic and also relatable couple out of the three is the last one, consisting of Kang Ha-neul and model-turned-actress E Som. Kang plays Su-ho, a talented songwriter who has never been on a date before because of the complex he has about his hearing ability. E plays Na-yeon, a confident woman who first approaches Su-ho through social media and asks him out. “The hardest part in directing the film was differentiating each of them with distinctive stories and auras,” said director Park at a press event on Feb. 3. “However, I think the basic role of a director is bringing good actors to the set, and in that sense my struggle was a pleasant thing to worry about,” she added. Although the film draws on typical happy-ending love stories, Park tried to imbue her personal beliefs into the screenplay. “I revised the screenplay in order to make my female characters into independent figures,” she said. “I didn’t want it to seem like females being dragged along by males, which is something common in Korean romances,” she added. The film opens nationwide on Feb. 18. "Like for Likes" released stills of Lee Mi-yeon, Yoo Ah-in, Choi Ji-woo, Kim Joo-hyeok, Kang Ha-neul and Esom. "Like for Likes" is a movie about men and women who really fall for each other after 'liking' everything on each others' SNS. 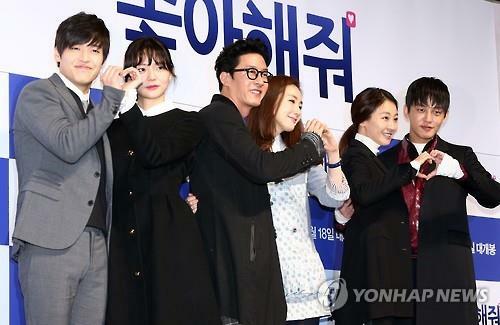 The three couples are Lee Mi-yeon, Yoo Ah-in, Kang Ha-neul, Choi Ji-woo and Kim Joo-hyeok. Lee Mi-yeon and Yoo Ah-in star in the movie as Jo Kyeong-ah and Noh Jin-woo. Noh Jin-woo appraoches Jo Kyeong-ah like a man and grabs her into a kiss. Yoo Ah-in is younger than Lee Mi-yeon. Choi Ji-woo and Kim Joo-hyeok take on the roles of Ham Joo-ran and Jeong Seong-chan who gets pulled towards each other while living under the same roof. Kang Ha-neul and Esom play born-single Lee Soo-ho and piano player Jang Na-yeon. She approaches him for the kiss first. The kiss scenes are increasing anticipation for the movie which will be released on the 17th. Yoo Ah-in, Choi Ji-woo, Lee Mi-yeon and other "Like for Likes" cast took a selfie together in a waiting room. On February 16th, CJenmmovie posted the adorable photo on their official Instagram account. In the revealed image, "Like for Likes" stars, Lee Mi-yeon, Yoo Ah-in, Choi Ji-woo, Kim Joo-hyeok, Kang Ha-neul, Esom stroke a pose together after finishing a promotional event. The sweet romance comedy, "Like for Likes" depicts the love story though SNS of the three couples: a successful writer Jo Kyeong-ah (Lee Mi-yeon) and actor No Jin-woo (Yoo Ah-in); a spinster working as a stewardess, Ham Joo-ran (Choi Ji-woo) and an old bachelor, who is her tenant, Jeong Seong-chan (Kim Joo-hyeok); playgirl Jang Na-yeon (Esom), a producer working for a broadcasting company, and a music composer, Lee Soo-ho (Kang Ha-neul), who has just begin dating someone for the first time. The cast of "Like for Likes"
[Upcoming DVD Release] Korean movie "Like for Likes"
Korean movie "Like for Likes" is available to preorder on DVD with English subtitles from YESASIA.